Heat sufficient oil in a kadai. Spread noodles in it and deep-fry, turning sides, till golden brown and crisp on both sides. Drain on absorbent paper. Heat 1 tablespoon oil in a non-stick pan. Add ginger, garlic, onion, bean sprouts, cabbage, French beans, carrots and capsicum, toss and sauté for 2 minutes. Transfer into a plate and set aside. Wipe the pan clean with a tissue paper. Pour 1½ cups vegetable stock into it and heat. Take cornflour in a bowl, add remaining stock and mix well to make a slurry. Add salt, pepper powder, soy sauce, tomato ketchup and chilli sauce to the vegetable stock, mix well and bring the mixture to a boil. Add some of the cornflour slurry, mix and cook till the sauce thickens. Add vinegar, mix well and simmer for 1 minute. Heat 1 tablespoon oil in another non-stick pan. Break eggs into it, sprinkle salt and pepper powder on top and cook sunny side up till the eggs are cooked. Add some of the sautéed vegetables to the sauce and mix well ensuring that all the vegetables are well coated with the sauce. 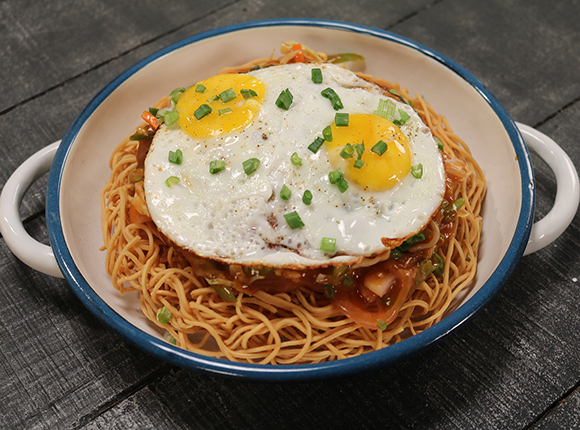 Place the fried noodles disc in a serving plate, pour the prepared sauce with vegetables on top, garnish with spring onion greens and place the fried eggs on top.